I decided to put the skills I learned in my screenwriting class to good use. Tonight, I started the first act of the screenplay adaptation of my first volume, The Young Guardians and the Genesis Spell. So far, the process is simple since I wrote the story once already. In my opinion, the difference between writing a novel and writing a screenplay is minimal. I look forward to continuing this new project and maybe I will be able to present it during WonderCon 2016. Wish me luck and I will keep you updated. Another symptom that comes with my autism is my laser-focused interests. Whenever I find something that I am seriously interested in, I become nearly obsessed with it! When I was a child, I had a very acute interest in dinosaurs and prehistory, which turned me into a prehistory encyclopedia. Ask me anything about dinosaurs and I would give you the answer (of course the information I memorized is probably dated by now). Another example of my intense interests is the fact that I am a completely devout Star Wars fanatic! Just like with my dinosaur phase, I memorized immense amounts of information about the Star Wars Universe, but I mostly scrapped my knowledge of the Legends Universe since Disney rebooted it. Even my writing itself is a huge interest that I am focused on and when I start writing a story, it becomes hard to stop writing because of my laser-focus! I recently encountered an old classmate of mine who is also autistic. However, his condition is far worse than mine. Just like when I was younger, he had no control over his motor functions and had no social skills. Fortunately, I noticed that he has gained much better control over his autism since high school. He still has a long way to go, but so far his improvement is noticeable. I am pleased with how far he has come and it is a pleasure to meet a kindred spirit. 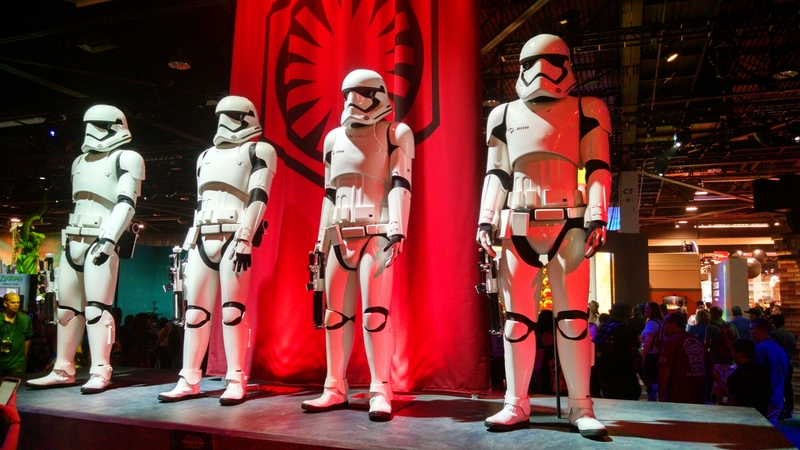 I went to the Disney Convention and met the First Order’s new recruits for Star Wars: The Force Awakens! I am excited for this movie! My family and friends are going to the midnight premiere! May the Force be with us! As my superhero universe continues to evolve, I am developing more ideas for future works. Because I enjoy the idea of a futuristic world, I am currently developing the inner workings of that society as well as how superheroes as an organization would operate in such a world. Also, I am brainstorming new short stories that will portray the origins of my female lead, Tinisha Dolaira, as well as a closer look into the evolution of the cyborg supervillain, Cyber Shadow. The most exciting part of my writing plan involves thinking of the final battle that will take place in my upcoming fifth volume. I look forward to diving into these works and transforming my superhero universe one word at a time. Wish me luck and Happy Thanksgiving! Possibly the most powerful superhuman ability is Power Mimicry, which is the ability to copy and use the powers of other superhumans. In various forms of fiction, there have been different depictions of this ability such as with Amazo from DC Comics, Sharingan users from Naruto, and Peter Petrelli from Heroes. Sometimes users can only use one copied power at a time, others can use multiple copied powers at the same time, while a rare few can use every single power they copied simultaneously to completely overwhelm their enemies. That is why Power Mimicry could be the strongest superhuman ability because there are thousands of known powers and this ability could potentially give the user access to all of them, which would be the closest to godhood a superhuman could possibly reach. I am think of giving this power to the main character of my sequel trilogy and it will not be unmatchably powerful at the beginning, but he will gradually learn to control his growing ability to reach the highest level. It will have considerable psychological effects on the character as he tries to digest each power he copies, which will be similar to the way I struggled with my autism. I would say that the publication of my first book was one of my most blissful moments. When I received the first copies, I felt like a proud father holding his newborn child in his hands. I admit that it was almost like a pleasant out-of-body experience like I had been emerging from a chrysalis after a lengthy metamorphosis. At that moment, I had discovered a way to create a career out of my imagination. It would be fair to say that it was a rite of passage. Two months later, things got even better! My first volume, The Young Guardians and the Genesis Spell, was nominated for the 2010 EVVY Awards. Then the Orange County Department of Education had me as their keynote speaker in 2009. The OCDE invited over 200 people from various school districts and I gave them a speech elaborating on my challenges with my autism. At the end of my speech, I received a standing ovation. One might say that being the keynote speaker for the OCDE was the first time I served as an autism ambassador. I was twenty years old! The next day, all of my friends, family, and loved ones (several hundred strong) gathered at The Old Spaghetti Factory, where a celebration was held for my first published work. There were decorative cakes, book signings, and all of the pasta we could eat. In addition, several of my loved ones had read my book before the celebration and they enjoyed it. That weekend was the best time of my life alongside WonderCon 2015. The level of recognition and support I gained from the EVVY Awards, OCDE, and my loved ones filled me with more hope and gratitude than I know what to do with. I will cherish that wonderful weekend, and my first volume, until the end of my days.